Bob Ruwart’s Cowboy – The Home of My "Big Things"
After stopping at Fort Laramie in Wyoming and seeing Chimney Rock and Scott’s Bluff in Nebraska we were driving south on I-25 to get to Rocky Mountain National Park. This cowboy was on the northbound side of the interstate but fortunately the exits were only about a mile apart. 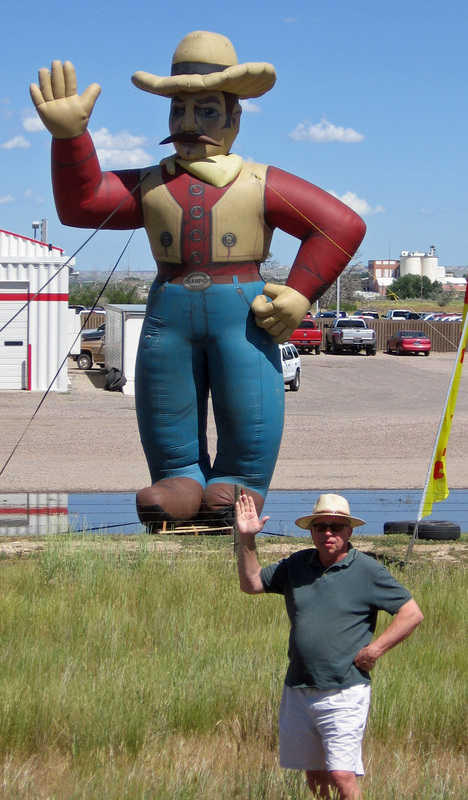 A quick turn around allowed me to get this cowboy on the grounds of Bob Ruwart Motors in Wheatland, Wyoming. Take exit 80 off I-29. Bob sells everything, Chevy, GMC, Buick as well as Chrysler, Dodge and Jeep.